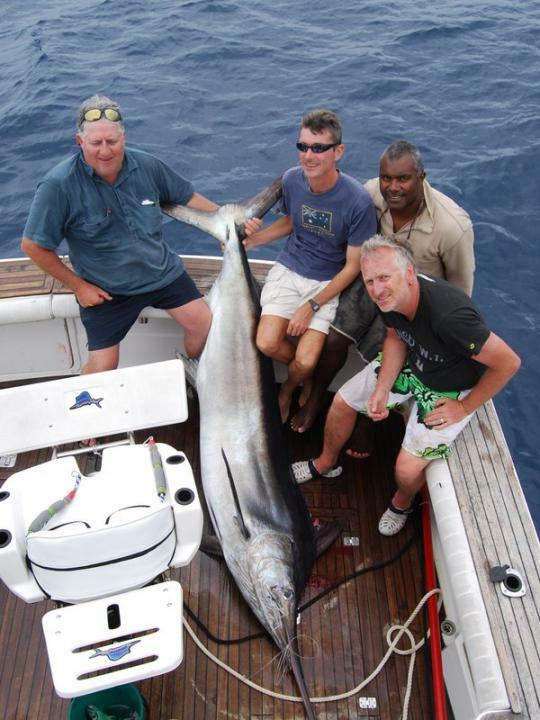 Kadavu island sees black, blue and striped marlin however the easiest marlin to target are the black marlin that are found close in to the Great Astrolabe barrier reef outer slopes. Little is known about these blacks but it is speculated that they migrate past Kadavu island on their journey to and from the breeding grounds off Australia's Great Barrier Reef. Bite Me holds the M-60 Fiji National Record with a fish of 220lbs but much larger fish have been seen by the resort's divers and a probable grander was briefly hooked by anglers aboard Offensive Tackle before throwing the hook. She was estimated to have been over 16 feet in length as she swam under the boat. DESCRIPTION : Black Marlin, Kadavu, Fiji Kadavu island sees black, blue and striped marlin however the easiest marlin to target are the black marlin that are found close in to the Great Astrolabe barrier reef outer slopes. Little is known about these blacks but it is speculated that they migrate past Kadavu island on their journey to and from the breeding grounds off Australia's Great Barrier Reef. Bite Me holds the M-60 Fiji National Record with a fish of 220lbs but much larger fish have been seen by the resort's divers and a probable grander was briefly hooked by anglers aboard Offensive Tackle before throwing the hook. She was estimated to have been over 16 feet in length as she swam under the boat.